Social Responsibility Topics: Promote, Share, Celebrate, Transparency, Support, Active Role, Innovation, comes from the Top. #1 Promote your Causes of CSR on your Website. Your web page should feature a tab that proudly promotes your CSR causes. Share your Mission statements, Customer Promises & CSR causes here. A Corp Social Responsability survey revealed that when a company touts their CSR, 76 % of surveyed millennials would do their own research to discern whether the company was being authentic. Be sure that you’re putting your money where your mouth is, or you risk being found out and deeply embarrassed. #2 Make sure every Employee knows your CSR promise and lives up to it. If you vow to support a cause, make a point to keep followers & employees updated on your major moves. This helps keep your employees engaged and ensures that they’re in line with your “vision” for true Corporate Social Responsibility. Whether it’s becoming sustainable, championing ethical sourcing or raising the quality of the employee experience, regular updates will help improve your ““image”” and give employees & followers something to cheer about. When our employee rose through the ranks from the production floor to CXO, we told the world. We published the news on our Blog and sent Press Releases to our contacts to celebrate their story with our company. Not only does this make our employees feel valued & proud, but it also showed our followers, customers & competitors that we value every member of our team. This is intensely motivating for everyone involved. While some corporations may think awards, recognitions and contests aren’t worth publishing on their media platforms, they are. This is a great strategy for promoting volunteerism & employee engagement + it allows others to become as invested in your Corp Social Responsability efforts as you are. “The Information Age” is more than an academic moniker, it’s an accurate assessment of the state of today’s world. When any one person is capable of disseminating information about your company and its practices to the entire internet, there’s no hope that you can hide how your company operates for very long. Instead of trying to confuse or divert attention from the way you do business, embrace your CSR and take the opposite route. By being aggressively & openly transparent, you can earn the trust that only comes by being completely honest about your organization’s practices. As well as encouraging your company to adopt Best Practices to begin with, that transparency sends a message to the world that you put a high value on your CSR and are not afraid to say so. Beyond participating in community events & other engagements, it’s important to become a direct supporter of the local community’s business people & companies. Always look for opportunities to support local events, especially when they’re promoting local businesses. Improving your Corporate Social Responsibility means adopting a dual mindset — along with making decisions that have a global impact, you also need to focus on your immediate surroundings and actively seek to be engaged in your local community. You should always look for opportunities to participate in community events, both to “do your part” and to make sure the community sees your company’s name at important local activities, allowing you to capitalize on the “soft marketing” & public relations benefits of being a responsible CSR citizen. For the best results, don’t leave local engagement as a side-show or occasional thought. Instead, directly assign at least one member of your team to actively plan out a few days of community service in every quarter and make sure your team understands its responsibility to support those efforts & participate in any events. Actively work to create an environment that encourages your employees to come forward with ideas about how to improve your CSR. By including their ideas & encouraging their active participation, you help to guarantee that CSR is a “daily driver” in your operations and not just a Public Relations selling point. In other words, responsibility becomes part of your performance culture & core values. 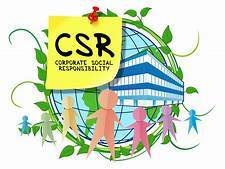 A company that operates with genuine CSR doesn’t wait for its employees to provide the motivating energy for responsible practices & activities. You can’t expect your new hires to come up with a grand new plan for engaging in CSR and nobody’s going to step outside the confines of their job role without encouragement. Instead, it’s vital to remember that a mandate to be a responsible corporate citizen comes from the top. As the leader of your company and all of its business practices, it’s up to you to lead the charge and make CSR a Core Value of your Culture. By actively encouraging the development of socially responsible programs, & soliciting ideas + participation from your employees and making sure that your company “puts its money where it’s mouth is” when it comes to CSR, you can ensure that your business has a positive impact on the world. Comments: Do you know of any other ways to apply Corporate Social Responsibility? For more Info, click on Social Responsibility, Core Values, Company Culture.